The Island Planning Commission will meet for the last time in 2016 next Tuesday at 6:00 PM at St. William Catholic Church. As always, citizens are encouraged to attend this meeting to not only hear the deliberations, but to make your opinions known to our planning commissioners. Please note that for preliminary plats and site plans, there is NO public hearing. So, citizens will only be allowed to comment or ask questions if the IPC elects to allow public comment. PP3399 – a request for preliminary plat approval for a three lot subdivision in the Island Retreat neighborhood. Specifically, the 0.5 acre parcel that is the subject of this request is located west of the Marshall Building complex, between Ocean Boulevard and Lord Avenue. It is zoned Village Residential, which sets the minimum lot size at 6,000 square feet. It should also be noted the the application incorporated an “abandoned” portion of Georgia Street into the middle of these three lots for access to that lot. SP3375 – a request for site plan approval for TWO 11,400 square foot office/retail buildings at 651 Sea Island Road. This is a request for a 6.89 acre parcel that is zoned Planned Development. It should be noted that the applicant is requesting approval for 133 parking spaces, whereas the ordinance only requires 76 spaces. It will be interesting to learn why the applicant feels the need for so many additional parking spaces and, with it, so much more impervious cover that will increase the storm water runoff from the property. SP3377 – this is a revised request for site plan approval for the Pilar Hotel, which was deferred by the IPC on two previous occasions. The property in question is at 1200 Ocean Boulevard and is zoned Highway Commercial. SP3405 – this is a request for site plan approval for the construction of a Southeastern Bank on 0.81 acres at 21 Market Street, in front of Cilantro’s restaurant. This is also a modification of a previously approved Planned Development. VP3408 – this is a Village Preservation application for a private residence at 605 Ocean Boulevard to add a garage, guest house and screened porch to the existing house and to rehab the front porch of the house. Please try to visit each of these locations prior to next Tuesday’s IPC meeting so that you can have the opportunity to see the existing condition of the property and its surrounding neighbors/uses and form an opinion about whether these requests should be approved. Let me suggest that changes to planned developments should be considered like zoning amendments, subject to public hearings, not just a site plan review. Also, the filling of fresh-water wetlands, aka swamps, needs to be of concern because the reduction of pervious surfaces has long-term consequences for aquifer recharge and rain water retention. Most of parcel # 04-05141, has an elevation of less than seven feet above sea level. So, to build on it would require considerable filling (ala Mariner’s Landing) and the removal or killing of all the mature trees. Trees were the subject of my last LTE, which didn’t get published. Perhaps a comparison is in order. Christmas trees, either dead or artificial, are decorated with machine and man-made artifacts to remind us of the living Christ. Christmas trees are symbolic. The maritime forests and even the planted pines covering the islands and low lands with a canopy for shade are organic systems with a multitude of functions. So, when our Glynn County Administrator, Alan Ours, talks of “sacrificing” trees to widen a few roads to increase traffic flow as affecting “what the canopy and the roadside look like,” he’s obviously missed the point that it’s what trees do, not what they look like, that’s important. Ours is not alone. There has been much wringing of hands about the damage inflicted by Hurricane Matthew without, apparently, any awareness that, if the trees hadn’t been there to take the brunt of the force of wind and water, our built environment would have been affected much more severely. Yes, pine trees, especially those standing by their lonesome, have a tendency to snap. And trees left standing after a thinning of the woodland to create a “see-through” buffer (e.g. “Mariners’ Landing” and “Canal Crossing) are more likely to be toppled in a storm, especially if their roots have been cut and/or flooded in a newly created swamp. Indeed, even on high land, selective cutting or trimming a stand of oaks, pines, cedar or cypress, leaves the remainder more vulnerable to the forces of nature. If our islands are to be protected from being eroded by water and wind, substantial buffers of indigenous, well-rooted vegetation need to be maintained–not stripped to produce a buff physique. It should be noted that the Soil Erosion and Sedimentation Prevention Act does nothing to preserve either our marshes, river fronts or swamps. 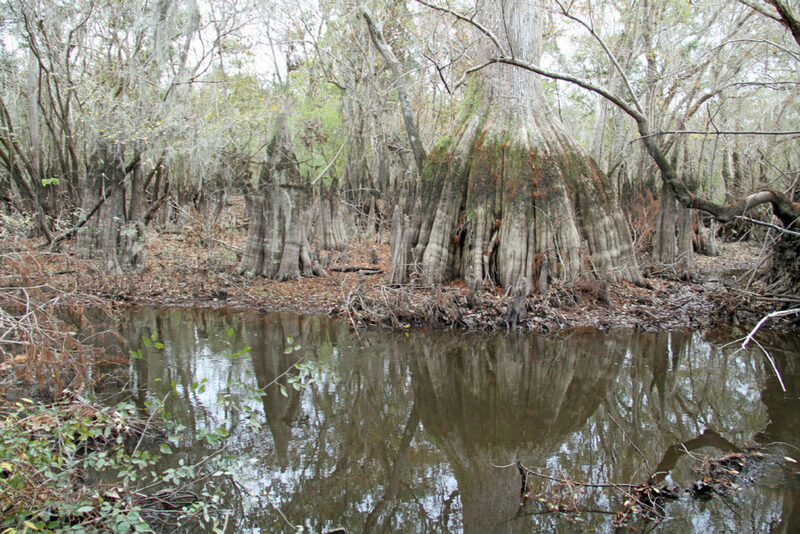 Swamps, by the way, are areas where water-loving large trees thrive and have existed for a very long time. This is a picture of James Holland’s favorite. The few remaining cypress along Sea Island Road will probably never get that big. That people in this part of the country are fixated on private property rights is understandable. After all, both property and personal rights are being violated on a regular basis. One need look no further than the trash that’s routinely thrown into our streets and woodlands to see the evidence. Also, because personal disrespect is harder to define, we focus on property. Then too, property rights have trumped human or personal rights since the beginning. Had to. Otherwise, the right to own people under the U.S. Constitution would have been inconsistent. So, property ruled and, as George W. Bush observed, we turned into an ownership society. Besides, ownership is a bundle of obligations, not a privileged state.